When the first door you open in the morning reveals a milk chocolate shepherd chasing a star, it can only mean one thing….. It’s Christmas!!! Cover your ears, everyone! Mariah Carey, Bruce Springsteen and Bono are set to be howling down your chimneys for the next three weeks – let’s hope no one’s stuck up there. The domino effect that arguably started with Periscope (Meerkat did get in there first, and of course YouTube has enabled live broadcasts for years – but I think you’ll agree that the advent of Periscope was the true turning point for live video) has now toppled Instagram, for the network has just announced Live video for Instagram Stories. Stories is the Snapchat-ish feature that has only been with us since August, but the updates have been coming thick and fast. You can see from the vid that Instagram is pushing this as a user-oriented update – and a young user-oriented update at that. With the similarities too, well, similar to be just coincidence, one suspects that there is considerable strategy at play to try and steal as many Snapchat (or Snap Inc., as it’s now called) users as possible – but we must leave that fight to the fighters for the moment, for we now have a new marketing opportunity that can’t be ignored. Despite my numerous rallying cries over previous weeks, I suspect that many of you may not as yet have found the time to get started with live video marketing on Periscope (shame on you! – it’s Christmas so I’ll forgive you). Getting started on building up a brand new audience from scratch is of course not easy, and you may very well have decided that your efforts were better concentrated on your existing audiences elsewhere. However, you will of course already have an established Instagram audience (not to mention a Facebook one), so your abilities to wriggle out of live broadcasts are narrowing all the time. So, make today the day you start considering your strategy. Despite the fact that Instagram features youngsters in their promo, the opportunities extend far beyond this demographic. Think along the lines of live video demonstrations, event promotions, behind the scenes tours of your company, and even jumping straight on the app to announce any new updates to your solution or breaking news in your larger industry. Live video is set to be a big deal – Facebook, Periscope, Twitter and now Instagram are all dabbling. Pinterest will undoubtedly be next, with LinkedIn perhaps dragging its heels like it normally does, but will inevitably get there eventually. Start experimenting now!! 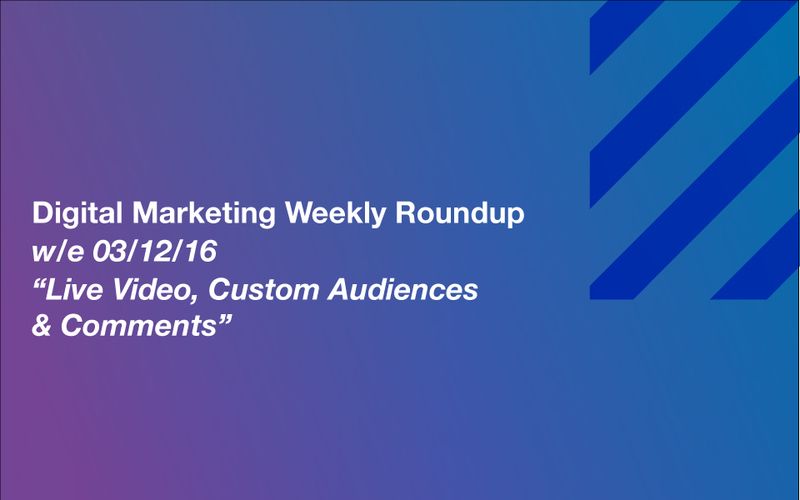 Are you familiar with Facebook Custom Audiences? If not, then you should check out our blog on the subject – ‘Facebook Custom Audiences: How to Retarget Your Facebook Leads’. To give you a quick overview, Facebook Custom Audience is a very clever and simple way to target your ads directly at the people who would most benefit from seeing them. Now, Facebook has added an update to the feature which allows advertisers to target a new segment – “everyone who engaged with your Page”. It has yet to be confirmed by Facebook as to when this will be widely available (not everyone can enjoy this feature yet). However, it’s almost bound to be coming soon – in fact, I’m actually surprised to learn that it wasn’t there already. Seems so obvious – but hey- ho-ho-ho, it will be coming soon. The screenshot (provided by adweek.com) shows that included in this new Custom Audience will be anyone and everyone who has “visited your Page or engaged with your Page’s content or ads on Facebook or Messenger.” These of course form the perfect audience to retarget – i.e. those that have already engaged with your business right there on Facebook (exactly where you will be retargeting them)… which is why I’m so baffled as to why this hasn’t always been there??? Am I missing something? Can any readers out there help? I suppose that Facebook retargeting has always been about reaching Facebook users who have engaged with your website – and the fact that we will soon be able to retarget those that have engaged with our Facebook page as well is only a good thing. The content marketer’s job doesn’t end when he/she publishes the content. Next comes the promotion, and then, of course, the ongoing engagement with followers and commenters in particular. Disqus has long been the go-to tool to power and manage follower engagement on company blogs. It’s brilliant – and now has just got even better. The improvements include the ability to prioritise comments that need the most urgent attention, one-click filtering of comments, and faster comment moderation with smart tags, highlights and histories. I’ve been having a play with the new features and can indeed confirm that Disqus now behaves much more intuitively, which will undoubtedly ensure that time is saved for us all. Engaging directly with our followers is one of the most important jobs of the marketer trying to secure new business – these Disqus updates might not seem like much, but by the time next Christmas comes around, there will have been every possibility to use them to make our efforts even more prosperous (so make sure that you do!). That’s it!! I’m off to deck the halls. See you next time with more Chrimbo puns and quips, and of course all the latest digital marketing updates. Peace and goodwill to all!